A locally owned South Shore family business for over 20 years! We are a full-service electrical contractor, working with you to accomplish your projects! Pembroke natives Scott and Debbie Matthews understand the mechanics of owning a small business. 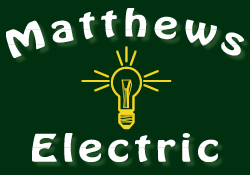 They launched Pembroke-based Matthews Electric Inc, a full service electrical contracting company nearly two decades ago out of their Pembroke home, and later out of a 3,000 square foot facility in Marshfield. Since the couple’s humble beginnings, Matthews Electric enhanced its breadth of expertise to include generator sales, installation and service, prompting the recent launch of the company’s sister business, New England Generator Corp. We have always done generator work and wanted to separate the generator part of the business so we could grow it. Matthews Electric expanded their corporate footprint in 2013 to include a 16,000 square foot commercial facility on Pembroke’s Columbia Rd. / Rte. 53. The company more than doubled its staff to include a collective 27 cross-trained technicians, 2 master electricians, and several journeyman electricians. Due to the growth, superior customer service, along with our Angie’s A+ rating Matthews Electric was the proud recipient of the Pembroke Chamber of Commerce’s 2013 Business of the Year award! We have embodied the qualities that all small business owners would love to achieve starting a small business in our home and slowly accomplishing all that we can do to build it into something bigger and more substantial. The key to the company’s success is simply this, understand what it is that the customer is requesting and provide them that exact service without overselling anything not needed. This along with placing a highly trained workforce into the field and providing superior customer satisfaction from our office is what separates us from the competition. Being homeowners ourselves we truly understand the responsibility of providing for our families and the day to day expenses of owning a home. We truly embrace the “Golden Rule” and treat every customer as if we would want to be treated. Our service team, electricians and office personnel are coached on a daily basis to remember this simple process. We understand that you are only as good as your last visit to the home. With our newly added customer service survey we analyze all of this information in order to improve our services in the future. We are dedicated to providing quality workmanship, competitive quotes and meeting all of your expectations. We plan to continue our growth and maintain a successful business. Check out our current employment opportunities to join the team!